Thanksgiving can be a day that takes a lot out of us as we prepare a big family feast. So… start your day off right. A powerful, vibrant breakfast is in order! Soak the dates for up to a half hour to soften and make blending easier. Place the chia seeds in a medium bowl and set aside. 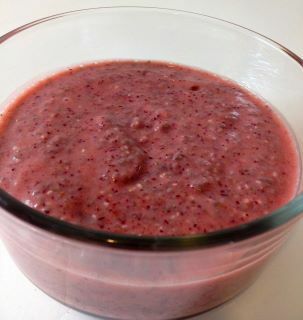 Blend the cranberries, milk, dates (with soak water), and almond extract in a blender. Pour the blended mixture into the bowl of chia seeds and stir. Wait a few minutes and stir again. Wait another few minutes, stir again. While waiting between stirs, take time to give thanks for all that you have in your life. *I have also made this with organic raw coconut crystals from Coconut Secret (although I prefer dates for their delightful texture! )… I put about a 1/2 cup in. So, if you don’t have dates on hand, feel free to use raw agave (I’ve not made with agave) or raw coconut sugar products. But! Keep in mind there’s a difference in the liquid ratio as a result so you can make adjustments (add more chia) or simply enjoy it a little more soupy. It’s all good. Holiday Chia Pudding Recipe: Raw, Vegan & AWESOME!